Not only is the Michigan Wind Chime attractive, the chimes sound beautiful. The Michigan Wind Chime is made from 3/4″ pine with two coats of Sikkens outdoor finish applied. Available in Cedar Red or Natural Brown. The Michigan Wind Chime has solid brass hardware along with tiger tail line for copper chimes. The copper has been sanded and sprayed with clear coat. 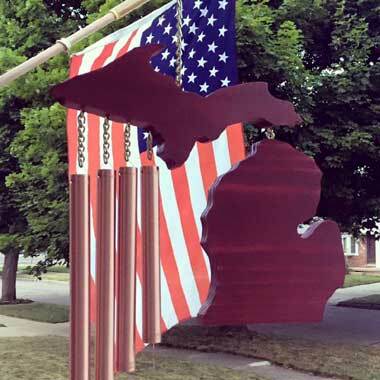 The overall dimension of the Michigan Wind Chime with Heart is approximately 13″ tall by 11″ wide.